Objective To investigate whether a whole grain diet alters the gut microbiome and insulin sensitivity, as well as biomarkers of metabolic health and gut functionality. Design 60 Danish adults at risk of developing metabolic syndrome were included in a randomised cross-over trial with two 8-week dietary intervention periods comprising whole grain diet and refined grain diet, separated by a washout period of ≥6 weeks. The response to the interventions on the gut microbiome composition and insulin sensitivity as well on measures of glucose and lipid metabolism, gut functionality, inflammatory markers, anthropometry and urine metabolomics were assessed. Results 50 participants completed both periods with a whole grain intake of 179±50 g/day and 13±10 g/day in the whole grain and refined grain period, respectively. Compliance was confirmed by a difference in plasma alkylresorcinols (p<0.0001). Compared with refined grain, whole grain did not significantly alter glucose homeostasis and did not induce major changes in the faecal microbiome. Also, breath hydrogen levels, plasma short-chain fatty acids, intestinal integrity and intestinal transit time were not affected. The whole grain diet did, however, compared with the refined grain diet, decrease body weight (p<0.0001), serum inflammatory markers, interleukin (IL)-6 (p=0.009) and C-reactive protein (p=0.003). The reduction in body weight was consistent with a reduction in energy intake, and IL-6 reduction was associated with the amount of whole grain consumed, in particular with intake of rye. Conclusion Compared with refined grain diet, whole grain diet did not alter insulin sensitivity and gut microbiome but reduced body weight and systemic low-grade inflammation. Trial registration number NCT01731366; Results. In epidemiological studies, whole grain consumption has repeatedly been associated with decreased risk of lifestyle-related diseases, such as type-2 diabetes and cardiovascular diseases. Accumulating evidence from rodent studies points towards the gut microbiota as a mediator of dietary impact on metabolic health. Microbial degradation of whole grains, rich in dietary fibres, leads to production of short-chain fatty acids and phenolic phytochemicals, which may exert beneficial effects on the host metabolism. Human dietary intervention studies show inconclusive results on the effect of whole grain intake on the gut microbiota and metabolic health. Intake of a diet rich in whole grains was associated with reduced energy intake and body weight and circulating markers of inflammation in adults at risk of developing metabolic syndrome. Reduction in fasting serum concentrations of interleukin 6 was directly associated to the amount of whole grain intake, in particular to rye intake. Compared with the refined grain diet, the whole grain-rich diet did not significantly modify faecal microbiome composition and metabolic potential as assessed by shotgun sequencing-based metagenomics and 16S rRNA amplicon profiling, fasting plasma concentrations of short-chain fatty acids, urine metabolomics or measures of intestinal integrity. Whole grain consumption significantly reduces energy intake and body weight in overweight adults, emphasising the feasibility of replacing refined grain foods with whole grains in weight management strategies. Whole grain consumption has beneficial effects on blood markers of subclinical inflammation in adults at risk of developing metabolic syndrome, and higher intake of whole grains should be encouraged in those at risk of inflammation-related diseases. Whole grain consumption associates with decreased risk of several lifestyle-related diseases including type 2 diabetes and cardiovascular diseases.1 2 Studies suggest that consumption of whole grain beneficially influences glucose metabolism,3 adiposity,4 blood lipids5 and markers of inflammation.6 A putative mediator of these effects is the gut microbiota.7 Whole grains are rich in phenolic phytochemicals and dietary fibres that are metabolised by the gut microbiota into short-chain fatty acids (SCFA),8 which have been linked to secretion of gut hormones,9 glucose and lipid metabolism,10 11 immune homeostasis12 and gut permeability.13 Only a limited number of human interventions have related whole grain-induced improvements on host metabolism with faecal microbiota composition,14–19 and so far the results have been inconclusive. This may be a result of large interindividual differences in microbiota composition,16 20 lack of gut microbiota exploration at high taxonomic and functional resolution level, high variability in background diet or lack of statistical power. Currently, it is not established to what extent beneficial effects of whole grain consumption are associated with the gut microbiota. The present study thus aimed to address the hypothesis that replacing refined grains with whole grains improves insulin sensitivity and alters the gut microbiome (primary outcomes) and biomarkers of metabolic health and gut functionality (secondary outcomes). This was investigated in a randomised cross-over trial comparing the effects of a mixed whole grain diet to an equivalent control diet based on refined grains. During the two dietary interventions, participants were provided with a selection of whole grain or comparable refined grain products (see online supplementary table S1). Participants were instructed to substitute all cereals in their diet with the study products and to consume these in an ad libitum manner. Products were considered as whole grain if they consisted of the intact, ground, cracked or flaked caryopses, where the starchy endosperm, germ and bran are present in the same relative proportions as in the intact caryopsis according to the definition proposed by the HEALTHGRAIN consortium in 2013.22 All whole grain products contained a minimum of 50% whole grain per dry matter. Analysis of study products for alkylresorcinols, resistant starch, arabinoxylan and monosaccharide content are described in online supplementary materials. The daily consumption of study dietary products (amount and type) as well as any deviations from the dietary instructions were registered in a study diary throughout both interventions. The study diary was used to calculate absolute consumption of the dietary products during the intervention and to assess compliance. Compliance was furthermore evaluated by measuring fasting concentrations of plasma alkylresorcinols, which are biomarkers of whole grain intake.23 Total dietary intake to determine whole grain, total energy and macronutrient intake was assessed by a 4-day precoded dietary registration, developed by the National Food Institute at the Technical University of Denmark.24 The diet registration was performed on 2 weekdays and 2 weekend days at baseline, reflecting habitual diet and at the end of each of the interventions to evaluate potential changes in diet beyond the intervention. Examinations were conducted in the beginning and in the end of each intervention. On each of the four examination visits, participants arrived in the morning after having fasted for ≥10 hours (h) and abstained from strenuous physical activity for ≥10 hour and alcohol consumption for ≥24 hour. In addition, participants were asked to avoid smoking and tooth brushing on the mornings of the examination days. On each examination visit, fasting morning blood samples were taken in supine position after a 10 min rest (t=0 min). Both serum and plasma fractions were obtained from the blood samples and immediately stored at −80°C until analyses. Biochemical analyses of blood samples including markers of glucose and lipid metabolism, hormones and inflammatory markers as well as quantification of plasma alkylresorcinols and SCFA are described in the online supplementary materials. The methodologies for the anthropometric and BP measurements are also described in the online lsupplementary materials. In addition to the fasting blood samples, postprandial samples were obtained (t=30, 60, 120 and 180 min) after ingestion of a standardised breakfast, consisting of white wheat bread, a pastry, butter, jam, cheese and 200 mL water (~3000 kJ, 52.6% of the energy (E%) from fat, 39.7 E% carbohydrates, 7.8 E% protein) and a drink containing lactulose (5 g) and mannitol (2 g). Breath hydrogen was measured in exhaled breath twice at fasting, and at the indicated times after the standardised breakfast as a proxy measure of colonic fermentation using a validated handheld Gastro+Gastrolyzer (Bedfont Scientific, Rochester, UK). On arrival on each examination day, participants emptied their bladder. Urine was collected for 4 hours after the standardised breakfast and the lactulose-mannitol containing drink. Urine was stored in the fridge during collection, pooled, mixed and aliquoted into 2.0 mL tubes and stored at −80°C. The percentage of excreted lactulose and mannitol in urine was measured as described in online supplementary materials. Gut permeability was estimated based on the ratio of urinary lactulose and mannitol. In addition, fasting serum concentrations of zonulin, a suggested biomarker of gut barrier function,25 were measured using IDK Zonulin ELISA kit (Immundiagnostik AG, Bensheim, Germany). The lower limit of detection was 0.22 ng/mL. Faecal samples were routinely collected on the morning of the examination day and stored at 5°C for maximally 24 hours before being homogenised in sterile water 1:1, aliquoted to cryotubes and stored at −80°C. Microbial DNA was extracted from the faecal samples as previously described26 27 and subjected to both 16S rRNA gene sequencing as described in Roager et al 28 and shotgun metagenomic sequencing with an average seven gigabases readout per sample (Illumina 100 bp pair end) as described in online supplementary materials. The microbial sequences obtained from shotgun metagenomics were mapped to the integrated catalogue of reference genes of the human gut microbiome.29 The genes were coabundance binned into metagenomic species30 from hereon referred to as species. The species were taxonomically annotated by sequence similarity to known reference genomes, which were downloaded as described by Nordahl et al.31 Microbial species and gene diversity, respectively, were calculated by means of Shannon index and richness, which is the number of observations per sample. To assign functions to genes, all genes were annotated to carbohydrate active enzymes (CAZy) from the CAZy database32 and to prokaryotic Kyoto Encyclopaedia of Genes and Genomes orthologies (KOs).33 Only species, CAZy and KOs detected in at least 10 individuals were included in statistical analyses. Microbiome data of one faecal sample from one individual were excluded, as the microbiome was significantly affected by intake of antibiotics. Details of the metagenomic sequence analysis are available in online supplementary materials. A complete set of urine samples were available from 48 participants. Exploratory non-targeted urinary metabolic profiling was performed by ultraperformance liquid chromatography mass spectrometry (UPLC-MS) with a quality control (QC) sample injected once for every 10 urine samples as previously described.28 Furthermore, all urine samples were derivatised using methyl chloroformate and profiled by gas chromatography mass spectrometry (GC-MS), enabling the relative quantification of amino and non-amino organic acids (78 metabolites).34 Details on the GC-MS analysis are available in online supplementary material. The coefficient of variance (CV)% of the metabolites in the QC samples measured by UPLC-MS in positive (1293 features) and negative (218 features) ionisation mode was on average 7% and 11%, respectively, whereas the CV% of the metabolites in the QC samples measured by GC-MS was 12% on average. The metabolites were identified according to four different identification levels as described by the Metabolomics Standard Initiative.35 Metabolite identification details are available in the online supplementary materials. All statistical analyses were performed in R version 3.1. Sample size estimation was based on a 0.25 difference in the homeostatic model assessment for insulin resistance (HOMA-IR) with an SD of 0.6,21 which at a 5% significance level and with 85% statistical power, required a sample size of 51 completing participants and a total of 60 with allowance of a 15% dropout. (See further details in the online supplementary materials). Available case analyses were carried out for all outcomes. The effects of the intervention on all outcomes were analysed using a linear mixed model with subject-specific and subject-within-visit random effects. The model included a treatment–visit interaction and adjustment for age and gender. The treatment–visit interaction term was defined to have eight levels including all combinations of treatment (two levels) and visit (four levels: visit 1=baseline 1, visit 2, visit 3=postrandomisation baseline 2, visit 4). For physiological outcomes, a common baseline effect (at visit 1) was assumed for both treatments, as it should be the same for all participants due to randomisation (corresponding to an interaction with seven levels). In addition, adjustment for body weight was included to ensure that changes in inflammatory markers were not associated with changes in body weight. Model assumptions on variance homogeneity and normality were assessed by visual inspection of residual plots, histograms and normal probability plots. Data not normally distributed including urine metabolome and faecal microbiome data were log transformed before analysis by the linear mixed model. Both prerandomisation and postrandomisation baseline measurements, obtained for visit 1 and 3, respectively, were considered to be part of the outcome to adjust for putative carry-over effects.36 For period 1, the treatment effect was estimated as the change from baseline at visit 1. For period 2, postrandomisation baseline measurements allowed estimation of a treatment effect during period 2 to be calculated as the change from the postrandomisation baseline at visit 3. The overall treatment effect was estimated as the average of the period 1 and period 2 treatment effects, and the differential change was estimated as the difference between the two estimated intervention effects. Urine metabolome and faecal microbiome p values were adjusted for multiple comparisons using the Benjamini-Hochberg false discovery rate (FDR).37 For comparison of endpoints of the two periods, a paired t-test or a Wilcoxon matched pairs test was used depending on whether the data were normally distributed. For comparison of data with only three time points available (dietary intake based on food diaries and intestinal transit time), one-way repeated measures analysis of variance (ANOVA) followed by Tukey’s Multiple Comparison test were used. For postprandial data (plasma glucose, serum insulin, serum-free fatty acids (FFA), plasma glucagon-like peptide (GLP)−1, plasma GLP-2 and breath hydrogen) collected with repeated measurements total area under the curve (AUC) was calculated by the trapezoidal rule as the entire area above zero. Post-prandial AUC values were compared between treatment groups using the linear mixed model. Correlations between changes in whole grain intake and changes in serum interleukin (IL)−6 and C-reactive protein (CRP), respectively, and correlations between changes in body weight, free fat mass, sagittal abdominal diameter (SAD) and changes in energy intake, as well as correlations between concentrations of urinary metabolites and whole grain intake at endpoints were calculated using Spearman’s rank or Pearson’s correlation depending on whether the data were normally distributed. For the linear regression analyses, data on plasma alkylresorcinol homologues, whole grain and fibre intake were log transformed and zero values were substituted with the minimum value. A total of 50 participants (18 men and 32 women) completed the two dietary intervention periods. See online supplementary table S2 for baseline characteristics and online supplementary figure S2 for a flow diagram. Overall, participants complied well with both diets, based on both food diaries and plasma alkylresorcinol concentrations. Consumption of equivalent study products was successfully matched between the two periods (see online supplementary table S3). Whole grain consumption was 68±45 g/day (mean±SD) at baseline, 179±50 g/day during the whole grain period and 13±10 g/day during the refined grain-based period (table 1), resulting in significant differences in whole grain and dietary fibre intake between the two periods (ANOVA; p<0.0001, table 1). Fasting plasma alkylresorcinols were increased by the whole grain diet compared with the refined grain diet (ANOVA; p<0.0001, table 1) and were positively correlated with consumption of whole grains (Spearman’s rho=0.69, p<0.0001) and total dietary fibre (Spearman’s rho=0.52, p<0.0001), providing unbiased support for subject compliance to the protocol. As expected, compared with the refined grain products, the whole grain products had higher contents of dietary fibre, arabinoxylan, alkylresorcinols and resistant starch (see online supplementary table S1) as well as higher average contents of arabinose, xylose and fucose and reduced contents of galacturonic acid (see online supplementary table S4). Although energy intake from the provided food products was 14% higher during the control period than during the whole grain period (paired t-test; p<0.001), the overall intake of energy (ie, provided foods and non-provided foods) did not differ between the two diet periods (table 1). Intake of nutrients and food groups did not differ between the two diets, except for dietary fibre and whole grains (table 1 and online supplementary table S5). The intervention did not result in any differential changes in markers of glucose metabolism (HOMA-IR, glycated haemoglobin (HbA1c), fasting serum C-peptide, fasting glucose and insulin), lipid metabolism (fasting serum concentrations of triacylglycerol, HDL, low-density lipoprotein and total cholesterol and FFA), liver function (alanine aminotransferase (ALT) and aspartate aminotransferase (AST)), satiety (fasting plasma concentrations of leptin, glucagon-like peptide (GLP)-1 and GLP-2) or systolic/diastolic BP (table 2 and online supplementary figure S3). However compared with the refined grain diet, the whole grain diet reduced body weight (p<0.001; table 2) and fat-free mass (p=0.010) and a tendency for a reduction in fat mass (p=0.057) was also observed. In addition, SAD decreased during the whole grain period compared with the refined grain period (p=0.001), and a similar tendency was observed for waist circumference (p=0.097). Changes in body weight, fat-free mass and SAD correlated with a difference in energy intake between the two periods (p<0.0001, p=0.0052 and p=0.024, respectively; figure 1), suggesting that the reduction in body weight was primarily explained by a lower energy intake. Although plasma leptin was not significantly different between interventions (p=0.07), the reductions in body weight and energy intake were both significantly associated with a reduction in plasma leptin (Pearson r=0.47, p<0.0001 and Pearson r=0.40, p=0.0057, respectively). Change in body composition was associated with change in energy intake. The difference in total energy intake between the two interventions (ΔEnergy) was associated with changes in (A) ΔBody weight, (B) ΔFat-free mass and (C) ΔSagittal abdominal diameter, where Δ refers to change of the given measure during the whole grain period minus the change of the given measure during the refined grain period. Correlations were calculated using Spearman’s rank or Pearson’s correlation depending on whether the data were normally distributed (n=50). The systemic low-grade inflammatory marker CRP decreased in serum during the whole grain diet compared with the refined grain diet (p=0.003; table 2). Likewise, serum concentrations of the proinflammatory cytokines, IL-6 and IL1β decreased (p=0.009 and 0.008, respectively), whereas tumour necrosis factor alpha concentrations remained unchanged. After adjustment for body weight, the reductions in CRP, IL-6 and IL-1β were still evident (p=0.004, p=0.047 and p=0.009, respectively). The change in serum concentrations of IL-6 was associated with the change in whole grain consumption (p=0.033, figure 2) but not with the change in energy intake. Whereas serum IL-6 concentrations were borderline negatively associated with total plasma alkylresorcinols (p=0.059; online supplementary table S6), IL-6 was negatively associated with plasma concentrations of alkylresorcinol homologues C17:0 and C19:0 (p=0.0003 and p=0.027; figure 2B and online supplementary table S6), which are the main homologues in rye products (see online supplementary table S1). In addition, IL-6 was negatively associated with the ratio of plasma alkylresorcinol homologues C17:0-to-C21:0 (p=0.024; figure 2B and online supplementary table S6), which is an estimate of the relative intake of whole grain wheat and rye,38 suggesting that the reduction in IL-6 was mainly associated with rye intake. Changes in CRP were not significantly associated with changes in whole grain consumption, energy intake or plasma alkylresorcinols (see online supplementary table S6). There was no difference in the urinary excretion of lactulose and mannitol nor the lactulose–mannitol ratio between the two diet periods (see online supplementary figure S4A-C). This was further supported by unaltered fasting serum concentrations of zonulin, a suggested biomarker of gut barrier function (see online supplementary figure S4D), indicating that there was no association between the reduction of inflammatory markers and markers of gut permeability. Change in fasting serum concentrations of IL-6 was associated with whole grain intake. (A) ΔIL-6, designating change in serum concentrations during the whole grain period minus the change during the refined grain, was negatively associated with ΔWhole grain intake, designating difference in whole grain intake between the two periods, as calculated by Spearman’s rank correlation (n=47). (B) Serum concentrations of IL-6 were negatively associated with plasma AR homologues (biomarkers of whole grain intake) and in particular with the C17:0 homologue (p=0.0003) and the ratio of C17:0-to-C21:0 (p=0.024), indicating a specific association with intake of whole grain rye, as calculated by linear regression analyses adjusted for age and gender (n=50) (see also online supplementary table S6). AR, alkylresorcinol; IL-6, interleukin 6. Relative to the refined grain diet, the whole grain diet did not result in significant changes in the faecal bacterial species diversity or richness of the microbial community (figure 3A–B). Moreover, no significant changes in the abundance of individual bacterial species, as assessed by shotgun sequencing, were observed after FDR correction for multiple testing (figure 3C and online supplementary table S7). Among the species, which were responding the most, four distinct strains of Faecalibacterium prausnitzii and one Prevotella copri increased in abundance after whole grain and decreased in abundance after refined grain consumption, whereas Bacteroides thetaiotaomicron changed in the opposite direction. Microbial gene diversity and richness remained unaffected (figure 3D–E). Two KOs significantly increased during the whole grain period as compared with the refined grain period, namely a lactose/L-arabinose transport system substrate-binding protein (KO K10188) and a glycosyl-1-phosphate transferase (KO K15915) (FDR corrected p<0.05; figure 3F and online supplementary table S8). We specifically tested changes in the abundance of saccharolytic genes,21 but no carbohydrate active enzymes were found to differ (see online supplementary table S9). Finally, since butyrate is predominantly synthesised via butyryl-CoA:acetate CoA-transferase genes,39 we specifically tested whether the abundance of any acetate CoA-transferase genes was significantly changed. However, this was not the case. In line with the shotgun metagenomics results, 16S rRNA gene sequencing did not reveal any significant differences in the faecal microbiota between the two dietary interventions (see online supplementary table S10). Among the most responding species mentioned above, several strains of Clostridiales and F. prausnitzii were positively associated with whole grain and fibre intake, whereas B. thetaiotaomicron was negatively associated with whole grain and fibre intake (FDR-corrected p<0.05; figure 3G–H and supplementary table S11), suggesting that these bacterial species were affected by the intervention. Only Erysipelatoclostridium ramosum was associated with serum IL-6 concentrations, however not with serum CRP concentrations (FDR-corrected p<0.05; figure 3I–J and supplementary table S11). Faecal microbiome composition did not differ between the two diets. (A) The subjects’ faecal microbial species diversity assessed by Shannon Index and (B) richness did not significantly differ between the two diets. Shown is the species diversity at baselines (white boxes) and at the end of the refined grain diet (orange boxes) and whole grain diet (green boxes). (C) Heatmap of the median fold changes in relative abundance of the individual MGSs during refined grain and whole grain diet, respectively. No MGSs changed significantly comparing the two periods. Of note, five species differed between diets with a FDR-P below 0.2 (red dotted line). (D) Gene diversity assessed by Shannon Index and (E) richness did not differ significantly between diets. Shown is the gene diversity at baselines (white boxes) and at the end of the refined grain diet (orange boxes) and whole grain diet (green boxes). (F) Heatmap of the median fold changes in relative abundance of the individual gene functions (KOs) during refined grain and whole grain diet, respectively. Two KOs differed significantly between diets with a FDR-P below 0.05 (red dotted line). Changes in microbiome composition were assessed by linear mixed model adjusted for age and gender followed by correction for multiple testing by the Benjamini-Hochberg approach (n=48) (see also online supplementary table S7 and S8). Among the bacterial species responding most to the intervention, several species were associated with (G) whole grain intake and (H) fibre intake, whereas only Erysipelatoclostridium ramosum was associated with (I) serum IL-6 concentrations and no species were associated with (J) serum CRP concentrations as assessed by the linear mixed model adjusted for age and gender followed by correction for multiple testing by the Benjamini-Hochberg approach (n=48) (see also online supplementary table S11). CRP, C-reactive protein; FDR-P, false discovery rate corrected p value; KEGG, Kyoto Encyclopaedia of Genes and Genomes; KO, KEGG orthologies; MGS, metagenomic species. Although enhanced whole grain consumption had only subtle effects on the faecal bacterial composition and genomically inferred bacterial activity, we investigated whether intestinal gas production, intestinal transit time and bacterially derived metabolites changed in response to increased whole grain intake. Neither fasting nor postprandial breath hydrogen excretion differed between the intervention periods (see online supplementary figure S5). Unaltered basal colonic bacterial fermentation was supported by an observed unaltered intestinal transit time (see online supplementary figure S6) and a non-detectable change in fasting plasma SCFA concentrations (see online supplementary table S12). However, we noted that a comparison of the treatment groups at end of the periods indicated higher plasma concentrations of butyrate after the whole grain intervention as compared with the refined grain interventions (paired t-test; p=0.022). Untargeted metabolic profiling of urine showed five urinary metabolites that increased during the whole grain period compared with the refined grain period (FDR-corrected p<0.05; table 3; see online supplementary table S13). Four of these were identified as urinary biomarkers of whole grain intake and included the whole grain derived alkylresorcinol 3-(3,5-dihydroxyphenyl)−1-propanoic acid-glucuronide (DHPPA-glucuronide),40 2-aminophenol-sulfate, a microbial degradation product of benzoxazinoids found in wheat and rye41 and the phenolic metabolites, pyrocatechol-sulfate and pyrocatechol-glucuronide produced by the gut microbiota from dietary phenolic compounds.42 All of these metabolites were positively correlated with whole grain intake (p<0.001; table 3), suggesting changes in these whole grain-derived metabolites in the systemic circulation. In addition, linear regression analyses showed that urinary concentrations of DHPPA-glucuronide was negatively associated with serum concentrations of both IL-6 and CRP (p=0.002 and p=0.032, respectively (see online supplementary table S14), and urinary concentrations of pyrocatechol-glucuronide and 2-aminophenol-sulfate were negatively associated with CRP (p=0.023 and p=0.018, respectively; see online supplementary table S14), substantiating the association between whole grain intake and serum concentrations of inflammatory markers. In contrast, urinary concentrations of the fifth metabolite, putatively identified as 3-methyladipic acid, did not correlate with whole grain intake, however, a linear regression analysis showed that it was negatively associated with body weight (p<0.0001). By a randomised, controlled cross-over trial comprising two 8-week dietary intervention periods in subjects exhibiting an increased metabolic risk profile, we demonstrated that a whole grain diet, as compared with a refined grain diet, reduced body weight and markers of low-grade systemic inflammation without significantly changing the faecal microbial composition, diversity or functional potential. Importantly, the observed effect of whole grain on inflammation markers was still evident after adjustment for weight loss. The effects on inflammation and body weight were the net result of the refined grain diet increasing weight and inflammatory markers and the whole grain diet reducing these parameters. However, we found no changes in glucose and lipid metabolism, markers for liver fibrosis, metabolic satiety-regulating hormones or BP after 8 weeks of enhanced whole grain intake as compared with refined grain intake. Noteworthy, the reduction in fasting serum concentrations of the proinflammatory cytokine IL-6 was directly related to change in whole grain intake and in particular to rye intake as suggested by the associations between IL-6 and plasma concentrations of alkylresorcinol C17:0, an alkylresorcinol homologue predominantly coming from rye products. The association between the reduction in inflammatory markers and whole grain consumption was substantiated by several urinary biomarkers of whole grain showing negative correlations to serum CRP and IL-6. Notably, the baseline values for the inflammatory markers prior to the whole grain and refined grain interventions, respectively, were not the same. Keeping in mind the cross-over design of our study, which means that half of the baseline measurements before the whole grain intervention come from individuals who have previously undergone the refined grain intervention and vice versa, the differences between the two baselines can be explained by carry-over effects pulling in two opposite directions. However, such effects were taken into account by the applied linear mixed model which adjusts for carry-over and period effects. Studies in mice have suggested that non-digestible fibres reduce systemic low-grade inflammation by changing the gut permeability.49 However, whole grain intake did not affect gut permeability in the present study. Instead, the associations between biomarkers of whole grain and proinflammatory markers suggest that changes in circulating levels of whole grain derived phytochemicals, in particular of rye, may be key to the health-promoting effects. 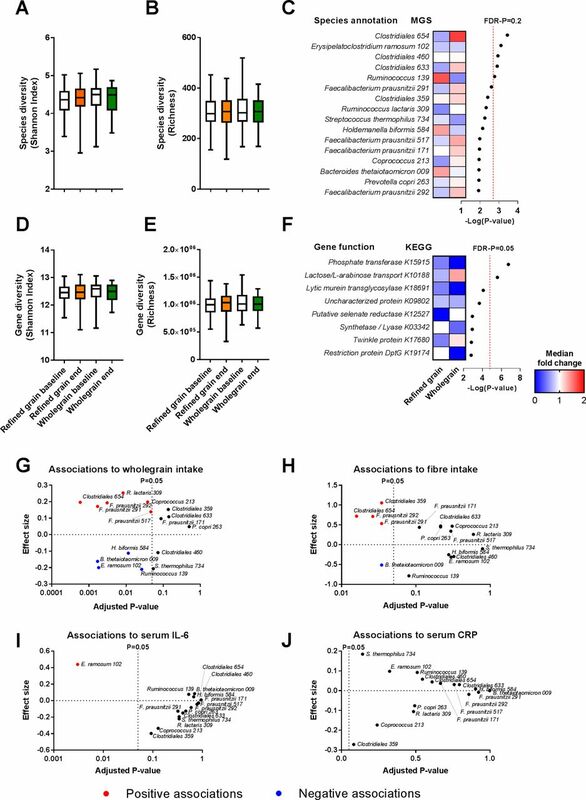 The gut microbiota has also been suggested to act as a mediator of whole grain-induced improvements on low-grade systemic inflammation and increased satiety48 50 via production of SCFA and other bioactive compounds.8 However, only a few observations in our study pointed towards an effect of whole grain on the gut microbiota composition. Consistent with increased levels of arabinose in the whole grain diet, we found a significant enrichment in genes involved in the bacterial lactose/L-arabinose transport system substrate-binding proteins in response to the whole grain diet as compared with the refined grain diet. Furthermore, we found increased urinary concentrations of whole grain-derived microbial metabolites, suggesting subtle whole grain-induced effects on the gut microbial metabolism. Although it has been reported that a sudden switch between plant-based and meat-based diets rapidly changes the composition and function of the microbiota,51 other studies have demonstrated absence of whole grain-induced changes of gut microbiota composition in both high-habitual and low-habitual whole grain consumers.14 15 19 52 While the design of previous studies may have impaired the ability to detect effects of interventions that did not imply significant changes from the habitual diet of some individuals, our present design, comparing a whole grain intervention directly to a refined grain intervention, must be expected to compensate for this problem. In contrast to previous studies, which typically involved sequencing only of bacterial 16S rRNA gene regions, here we applied both deep metagenomic (shotgun) sequencing and 16S rRNA amplicon profiling allowing us to analyse the microbiome response at both species and functional levels. Yet, we identified only subtle responses to the intervention. None of the most intervention-responsive bacterial species remained significantly changed after adjusting for multiple testing, however, it should be noted that in line with our observations, a whole grain-induced increase in F. prausnitzii, P. copri and Clostridiales has been observed also in other studies examining the effects of dietary fibres on the gut microbiota.53 54 The associations between whole grain intake and strains of F. prausnitzii and Clostridiales and the inverse association between whole grain intake and B. thetaiotaomicron suggest that these bacteria were indeed responding to the dietary intervention. Dietary fibre-induced blooming of the butyrate-producing F. prausnitzii at the expense of Bacteroides has previously been shown in vitro as a result of a drop in pH.55 However, here we did not observe any differences in plasma SCFAs or intestinal transit time to suggest a changed colonic pH.56 Among the most responding species, E. ramosum was associated with serum IL-6 concentrations. This species has been reported to promote obesity in mice fed a high fat diet57 and to be abundant in individuals with low microbiome gene count and high plasma concentrations of CRP,58 suggesting that a whole grain-induced reduction of E. ramosum may have contributed to the observed reduction in weight and IL-6. The limited effects of whole grains on the gut microbiota in clinical trials may reflect that whole grains as a food group recommended as part of a healthy diet have been diffusely defined and may have included different cereals such as wheat, rye and oat, which may exert very different effects on the individual gut microbes. Therefore, future studies should rather focus on examining the effect of specific grains. In summary, we found that a whole grain diet as compared with a refined grain diet reduced energy intake and body weight and the low-grade systemic inflammation markers CRP and IL-6, without significantly altering whole body insulin sensitivity, gut microbiome or gut functionality in terms of intestinal integrity and transit time. Thus, in contrast to our hypothesis, the health benefits of this specific diet rich in whole grains appeared to be independent of changes in the gut microbiome composition within an 8-week diet study. We dedicate this paper to the memory of our friend, colleague and collaborator, Lasse Ingvar Hellgren, who stayed a committed member of the scientific committee of the 3G centre until he passed away in June 2017. The authors thank Axel Kornerup (University of Copenhagen) who has participated in many good discussions as a member of the scientific committee, as well as Sarah Ben Soltane, Charlotte Holm Brodersen, Pernille Lærke Bjørndal Hollænder and Anne Marie Raabyemagle (University of Copenhagen) for their help with the human intervention trial and analysis of blood samples, Kate V. Vibefelt (Technical University of Denmark) for DNA extraction, Neslihan Bicen (Technical University of Denmark) for PCR and sequencing and Morgan Han and Elizabeth McKenzie (The University of Auckland) for excellent technical support on GC-MS analyses. Sequencing was carried out by the Technical University of Denmark in-house facility (DTU Multi-Assay Core, DMAC), in collaboration with BGI Copenhagen. We also gratefully acknowledge the Danish National Supercomputer for Life Sciences—Computerome (computerome.dtu.dk) for the computational resources to perform the sequence analyses. The Novo Nordisk Foundation Center for Basic Metabolic Research is an independent research centre at the University of Copenhagen and is partly funded by an unrestricted donation from the Novo Nordisk Foundation.
. Substituting whole grains for refined grains in a 6-wk randomized trial has a modest effect on gut microbiota and immune and inflammatory markers of healthy adults. Am J Clin Nutr 2017.
. Applied Longitudinal Analysis. 2nd edn: John Wiley & Sons, Inc, 2011.
. Controlling the false discovery rate—a practical and powerful approach to multiple testing. J R Stat Soc Ser B-Methodological 1995;57:289–300.
. The effects of a whole grain-enriched hypocaloric diet on cardiovascular disease risk factors in men and women with metabolic syndrome. Am J Clin Nutr 2008;87:79–90. HMR and JKV contributed equally. Contributors Conception and design of the study: MK, LL, MIB, HF, RG, KK,HV, TH, OP, TRL; collection of data and biological samples: MK, SI, RG, MVL,RBM, LL; analysis of markers of host physiology: RBM, HF, LL, MVL, SB, JJH; faecal microbiota: JKV, LBSH, RLN, MIB, MDD, VC, HBN, RG; plasma short-chainfatty acids: RL; plasma alkylresorcinols: MVL, ABR; urine metabolome: HMR, HLF,SVB; intestinal transit time: MHS, AFC; lactulose-mannitol excretion: ABR; study products: MK, SI, MVL, JH, ASM, AB; data analysis and interpretation: HMR, JKV,MK, LBSH, MVL, RBM, MIB, RLN, HF, CTE, CR, HBN, RG, LL, TLR; manuscript drafting: HMR, JKV, MK, MIB, LL and TLR. All authors read, revised and approved the final manuscript. Funding This study was supported by the Innovation Fund Denmark (grant no. 11-116163/0603-00487B; Center for Gut, Grain and Greens (3G Center)). RLN was supported by a grant from DTU and the Sino-Danish Center for Education and Research. Competing interests MV Lind was partly supported by an unrestricted grant from Cereal Partners Worldwide, a joint venture between Nestlé SA and General Mills Ltd. There were no conflict of interest to declare for the other authors. Intervention products were sponsored by Kohberg, Lantmännen, AXA, Wasa, Urtekram, Finax and Doves Farm. Sponsors of grants and products played no role in the design, methods, data management and analysis nor in the decision to publish. Ethics approval Municipal Ethical Committee of the Capital Region of Denmark. Correction notice This article has been corrected since it published Online First. An additional author has been added.